Massages also provide a feeling of caring and a comfort of connection. Two of our spa’s most popular massages are Swedish Massage and Knead the Knots Massage (deep tissue). A gentle touch, full body relaxing massage to help relax and energize you. (Deep Tissue) Slower more intense touch to target deeper layers of muscle; commonly to help with muscle damage from injuries. How incredible is all of this! 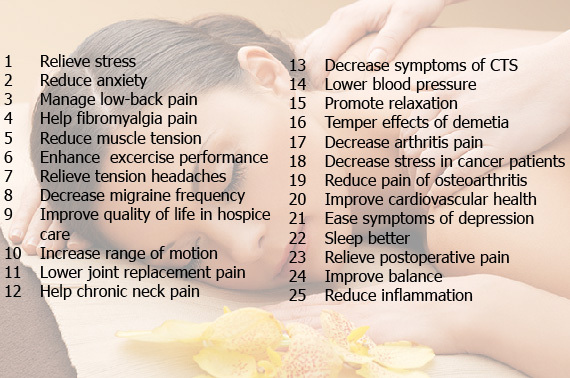 Here’s 25 more reasons to getting massages! Wow! Are you already calling Elements to book your next massage? I sure am! I hope this post was educational to you all! Massages provide so many incredible benefits! Give us a call and book your next massage!